It is a well moderated forum and the members and moderator there are very helpful. Q: I have Craftsman, 18 HP [opposed Kohler] powered 46″ triple blade garden tractor. While mowing the electric clutch fell of and was badly damaged by the mower blades. The 7/16″ bolt and washer went into the crankshaft end, holding the electric clutch in place, sheared the hex head off. The rest of the bolt stayed in the shaft. What would cause that kind of extreme breakage? A: If the bolt was not completely tight, that could cause the bolt head breakage. and then there was no juice in battery to start engine again. I charged the battery and the engine started and ran fine several times. I started mowing again and same thing happened after a while, the electric clutch stopped and the engine still ran. We cannot find any naked wires or anything grounded out. less your charging system is not working. Try replacing the rectifier. as soon as I start the tractor the blades are engaged. and correct width belt on your unit? clutch? Just trying to figure out where to start replacing stuff. switch and the PTO clutch, you might need a new clutch. Q: Is there a way to increase the performance of my new FS5500 Craftsman lawn tractor’s transaxle? Perhaps a valve that can be shimmed up. Under heavy load it’s like pulling a harrow uphill, the engine doesn’t bog down but the wheels don’t turn. I can back up, take the hill at a lesser angle & it does fine. I plan on installing some lug tread tires too. A: They have that safety feature built into the transmission because the transmission will not hold up to a higher stress level. 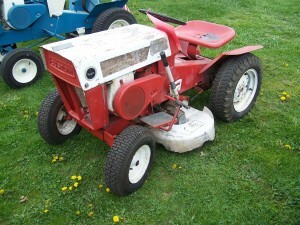 Q: I own a Sears 14HP garden tractor and it is approximately 6-8 yrs old. I have noticed that it runs rough at low speed. I have changed the spark plugs but no change. A: It could be a dirty carburetor or water in the carburetor. I think you should try adjusting your valve clearance. I have a question..I have a Craftsman 19.5 hp 42″ Lawn Tractor with a very elusive problem. Last year I couldn’t get the motor to run without standing over it pouring gas in the carburator. This year I rebuilt the car again and replaced all the fuel lines. New problem, The motor wouldn’t turn over at all. I replaced the battery and after 20 minutes of banging on controls and safety switches the thing finally turned over and started to come to life. It died out and again wouldn’t turn over. I could turn the motor by hand, I bypassed the solenoid and the starter turned the motor over no problem so I went back to the safety switched and contacted a local repairman. he advised that I could disconnect the kill switch and it should turn over. I did this an did started right up and I was able to drive it around and parked it so I could air up tires and tighten some bolts. Now it is back to not doing anything. I have good battery power and I can still bypass the solenoid to turn the motor over. I still have the kill switch disconnected. Anyone have an Idea of how I can get this thing to run again? Unfortunately this is something I can’t diagnose without being there with the tractor, I could if it was here.